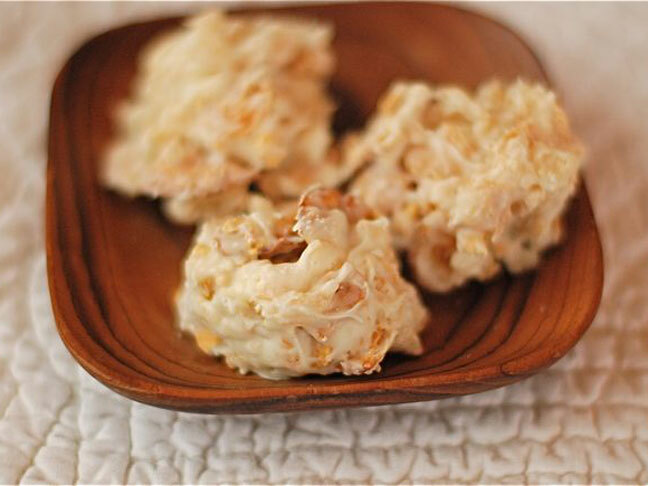 I love a good Christmas cookie as much as the next girl, but when I’m in the mood for something different I make Crispy Crunchy White Chocolate Balls. I did not invent this concept, crunchy nuts and crispy cereal rolled up into a ball of chocolate is found nearly everywhere around the holidays. This is my personal spin on the recipe. After lots of taste testing I’ve come up with a great combination of tastes I love, along with a satisfying texture to boot. Make this with your kids and have a blast! 1. Stir Rice Krispies, pretzels and corn flakes in a large mixing bowl. 2. In a glass bowl set over simmering water melt the white chocolate chips until smooth and creamy. 3. Pour the melted chocolate over the cereal mixture and stir it in with a spatula until everything is coated. 4. Using an ice cream scoop to form balls of this mixture and place the balls on a parchment lined cookie sheet or into mini muffin liners. Chill in the refrigerator for an hour or two to allow the chocolate to harden. Eat up!